Now this may just be me, but George Kennedy doesn’t resemble Yul Brynner too much. 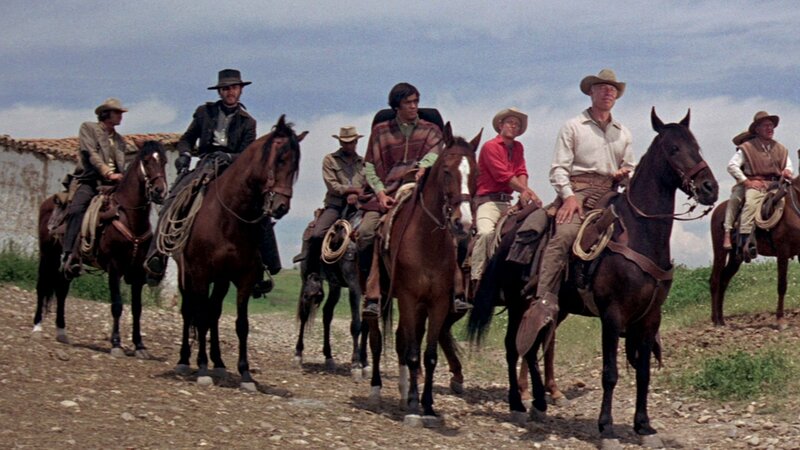 After two “Magnificent Seven” movies with Brynner as the star, the third movie starred a new ‘Chris’ leading a new seven. 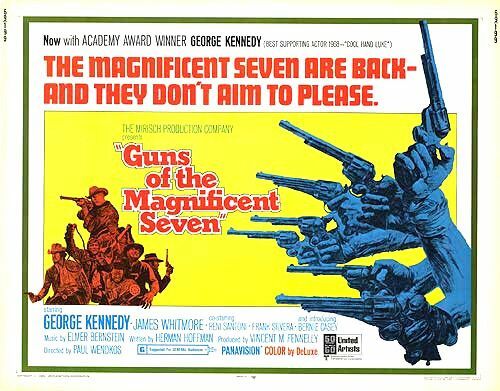 Of course, the posters for “The Guns of the Magnificent Seven” have to nail this down. So is he the same character? A different guy named Chris? Did he undergo extensive plastic surgery? Okay, maybe not that last one, but you get the idea. So, before loyalists chap their hides over Denzel Washington leading a new Magnificent Seven, let’s take a look at the first actor to replace Brynner. 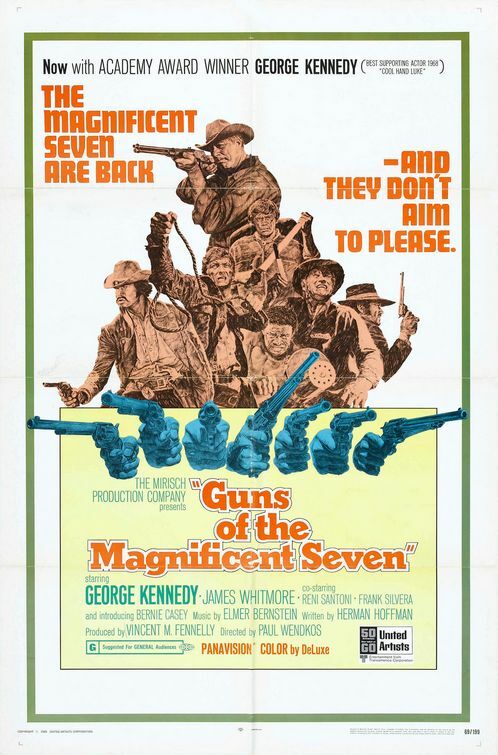 Three years removed from “Return of the Magnificent Seven” comes director Paul Wendko’s take on the popular series, 1969’s “Guns of the Magnificent Seven”. It’s a departure from the first two movies with Kennedy, a year removed from the Best Supporting Actor Oscar he earned from “Cool Hand Luke, stepping into the saddle. But where “Return” was basically a rehash of the original classic, “Guns” gets points for originality both in story and casting. Also, having Elmer Bernstein’s score doesn’t hurt, especially with some new notes in the music. Deep in Mexico, a revolutionary leader, Quintero (Fernando Rey, who played a different character in the last movie) is captured by a sadistic Mexican colonel, Diego (Michael Ansara), who runs a prison that resembles a fortress more than anything else. One of Quintero’s most loyal followers, Maximilliano (Reni Santoni) heads north to look for help in getting Quintero out of prison before it’s too late. In a border town, Max finds a man named Chris Adams (Kennedy) who’s in the process of saving another man, Keno (Monte Markham), from a lynch mob. Chris agrees to help out and assembles a group of specialists to help him in the prison break. They seek help from a local bandit Lobero (Frank Silvera) and his gang – quite a change of pace since the original film, but the odds still seem impossible. The Seven: Kennedy is more than capable of handling the lead role, and while he doesn’t look like Brynner at all, he brings the same characteristics to the part: loyal, honest, and always willing to stand up for the downtrodden. He’s also chomping in a stogie throughout, a trademark made recognizable with Brynner. As for the other six, this is by far the most unique group when comparing the three sequels. Markham as Keno, the Steve McQueen right hand man role, isn’t given a ton to do after his introduction, but as a right hand man, he does what he’s supposed to; look cool while helping the leader. Santoni’s Max is a youngster with little fighting experience but who wants nothing more than to join the fight. In adding a black character, dynamite expert Cassie (Bernie Casey) the dimension of race is added and even more so with another member of the seven, Slater (Joe Don Baker), a one-armed Confederate gunslinger. Cassie and Slater would seem to have nothing in common, but a friendship develops when they realize how similar they really are. James Whitmore, as solid as ever, plays Levi, an aging knife fighter who’s settled down with a family but takes the job for the dough. Adding some depth to the character, Levi bonds with Emil (Tony Davis), a young Mexican boy looking for his father. Unfortunately, the seventh member, P.J. (Scott Thomas) receives little development which is a shame because an expert gunfighter/rope thrower dying of tuberculosis has some potential. The villain is a definite step-up here after Emilio Fernandez’s part in “Return”. Ansara plays Diego as a sadistic commandant trying to snuff out the revolution in his district no matter what the cost, especially when it comes to torturing his prisoners. One torture scene midway through the movie shows a creative way to take care of prisoners – bury them in sand up to their throats and then trample and suffocate them with horses walking all around them. Ansara’s Diego may not be as developed as Calvera or Lorca in the two previous movies, but he’s a straight-up bad guy and sometimes that’s all you need. Some critics said this movie is too slow-going and to be fair, there isn’t a ton of action. But really, none of these movies are action-packed. Characters are introduced, we get to know them, and then throw in the action so that when some of the seven do eventually die, their deaths mean something emotionally. The finale in “Guns” is on par with the shootout at the end of the original. Finally ready for their assault, Chris leads the seven and a small group of farmers in an attack on Diego’s prison, dubbed the ‘Cave of the Rats,’ and his two-hundred-man garrison. The movie is loud, chaotic and violent, and completely different from the rest of the series. For one, the seven go on the attack instead of waiting to be attacked against larger numbers. Second, two characters are killed almost at the outset of the battle, and for a while it looks like the plan might actually fail. The attack is a great action sequence from start to finish and the prison set looks pretty cool too. There’s even some surprises as to who survives and who doesn’t to keep you guessing. A worthy sequel to the original for sure. It does justice in every way while still putting its own spin on a familiar story. Good casting and a strong script that really fleshes out the new members of the “Magnificent Seven” with a great, action-packed finale.